It is a time honored tradition for the groom to give the best man a special gift. It is meant to be a token of the groom's appreciation for all of the hard work and support the best man has given up to the time of the ceremony. 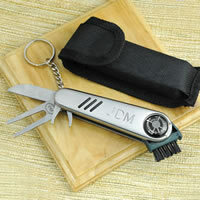 It should be given when you give the ushers their gifts, but should not be the same and it should also cost a bit more. Here are a few suggestions on how to pick a great gift for the best man. 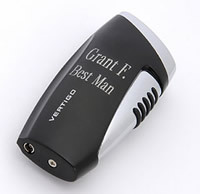 You can't go wrong if you select a best man's gift if you shop according to his personal taste, interest and hobbies. For example: if you know that he is passionate about football, then a couple of tickets to a favorite team game would be a pleaser. 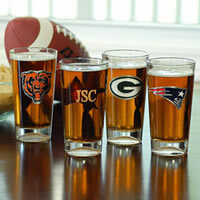 For a creative presentation (and something that will last) place them in a personalized mug or beer stein with his favorite team emblem or logo. Cleverly place a gift card from a fishing and tackle shop, home improvement store or favorite restaurant inside a monogrammed beer stein. You can also place gift cards in a personalized bag or cooler. Anything that reminds him of the good times the two of you have had together as buddies in past years will bring a smile to his face. It could be a college memento, an item from the old neighborhood and of course, an engraved frame with a picture of the two of you in your wedding attire. 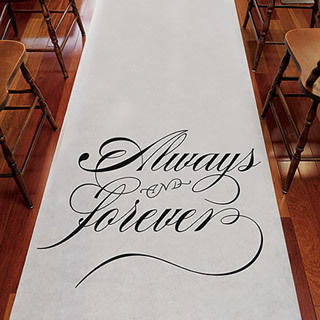 The classic “Always & Forever" inscription printed on this Aisle Runner will add a romantic touch to any ceremony aisle, whether in a church or outdoor setting. Comes with attached cord handle and double-sided adhesive tape along the leading edge to secure in place. Plan to sprinkle with rose or flower petals in colors that complement your special day! Made of tear resistant non-woven fabric. This runner measures 39" (W) x 75 feet (H). 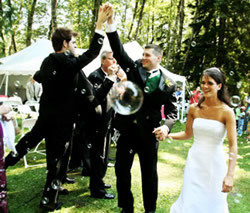 More wedding supplies at WhereBridesGo.com.